While your documentarian is remembering where the little slips of paper may be that people so kindly use each week to describe their dishes, and which frequently serve as our online record for that week, let us note two things. 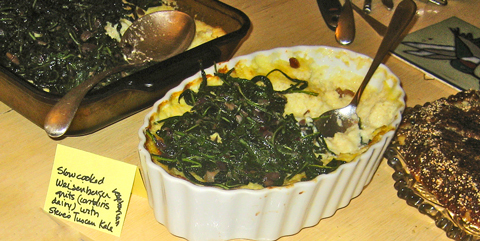 First, new people continue coming to Cornbread Supper, and we like so much that they do. Each week, as one frequent Supperian put it recently, is fun, and each week it's a different kind of fun. Some weeks feature 50 people, 15 of them under 4 feet tall, and other weeks feature 12 full-grown humans sitting in one large circle. All good. Second, last week something remarkable happened, something worth sharing. One of the hosts, Steve, had to leave for another commitment right as Supper began. As he headed out the front door, one of our young neighbors, perhaps six years old, saw him going and asked whether he should save some cornbread for Steve. Steve said "Yes," and kept going. 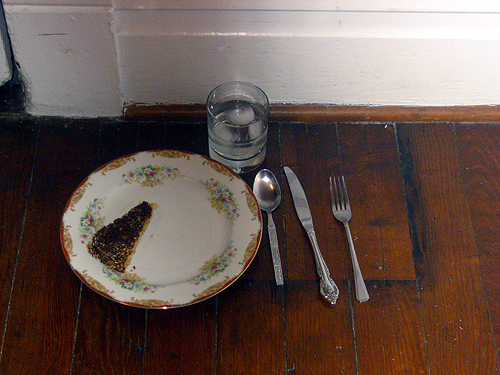 Young neighbor set up a piece of cornbread on a plate, a glass of water, and tableware for Steve, placing it on the coffee table. Young neighbor's younger sister proceeded to eat the saved cornbread, which was just at her level. And so our kind young neighbor did it all again: put cornbread on a clean plate, got a water glass and tableware, and put it where no one would bother it, in a secret spot on the kitchen floor. The secret spot worked, and the cornbread stayed in place until Steve returned home. Steve was most pleased by this kind attention. Eggplant Dip a la Lucy!